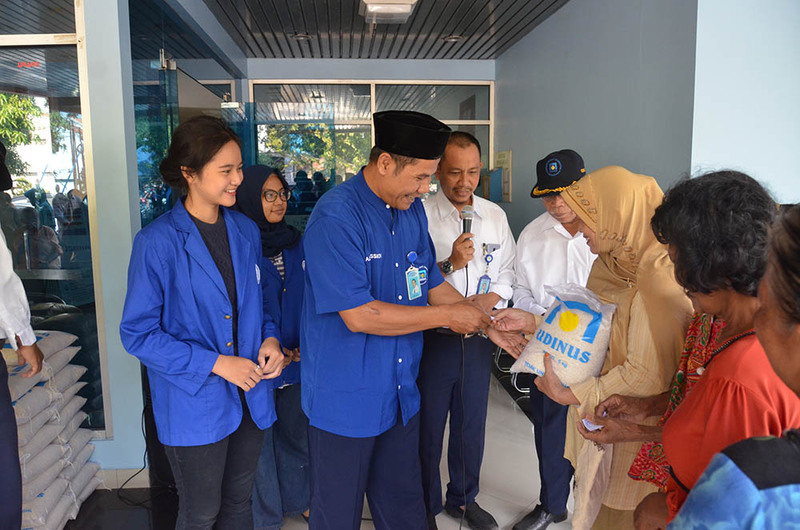 During Ramadan1439 H, Universitas Dian Nuswantoro (UDINUS) distributed 1000 bags of rice with a total weight of five tons for underprivileged communities in several places in Semarang. Distribute bags of rice is a routine activity that UDINUS conducts every Ramadan. The distribution is not only in the area nearby UDINUS, but also it is distributed In Durian, Papandayan, Srondol and Ngaliyan. The Coordinator of Udinus Peduli activity as well as The Head of UDINUS’ Public Bureau, Sarju, S, Kom, MM, said that the activity was one of the forms of community service as stipulated in University’s Tri Dharma. UDINUS also ready in handling disasters in Indonesia, for example like in Banjarnegara some time ago. "We are not only care about education, but also on the social conditions that exist in the environment nearby and in Central Java," he said. He hoped that the activity could be beneficial to the environment nearby and also could ease the burden of the underprivileged community. UDINUS hoped that there would be a mutualism symbiosis between the community and the University. "UDINUS is very respectful towards the people around Pendrikan Kidul because they have accepted the existence of UDINUS very well," he said. Margono , one of the people who received 5 Kg bag of rice, hoped that UDINUS Peduli activities could be improved and did not stop in the middle of the road, because the activity could ease the burden of underprivileged community since the price of basic foods always raising up during Ramadan. "We wish UDINUS to be success and always care about the people around and Central Java," he said.